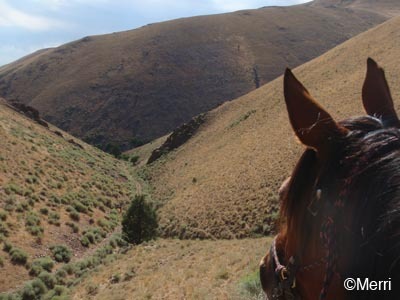 We've been talking about finding a trail to ride up into the Owyhee Mountains to Burnam Flat from home. 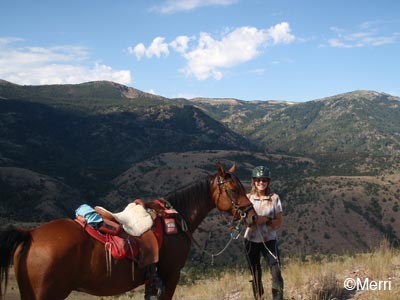 Over the years, Steph, Carol, and Regina have ridden up there at different places with some ranchers, but some of it always involved scrambling off trails up some steep slopes, and they don't exactly remember the routes. If you don't know where the gates are, you won't get through, and we tend to like to avoid cliffs. Regina and I studied maps and Google Earth (I caught Steph's bug - it's addicting when you look at 3D images of mountains and wonder where you can go and how you can get there! 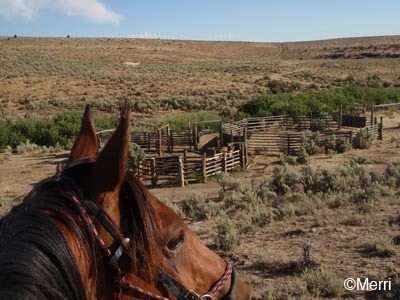 ), and we plotted some of the cow trails Regina rode with the Joyce Ranch cowboys as they were gathering cattle last fall. You can't always see existing roads on Google Earth (because of the forest), and you sure can't trust the accuracy of the USGS maps - sometimes they show old roads and trails that no longer exist; sometimes they don't show the newer roads that do exist. Regina has a good knowledge of the area, but a lot of that is cross country because that's how the cows go. 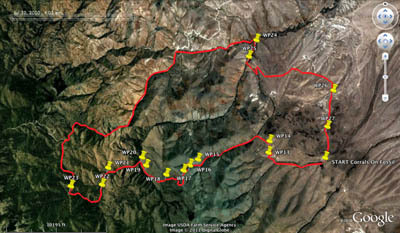 I drew our proposed route on the maps: up Fossil Creek and cross to Gerdie Creek where there is a road (Regina rode on it) going up the creek; up out of that drainage, over a saddle to the Sinker drainage, down and along the (? unnamed?) Southeast Fork of Sinker, turn up the South Fork of Sinker, and hit Scotch Bob Road. If we were lucky. It was maybe 7 mountain miles in to Scotch Bob Road, so either 7 miles back out, or find another route. 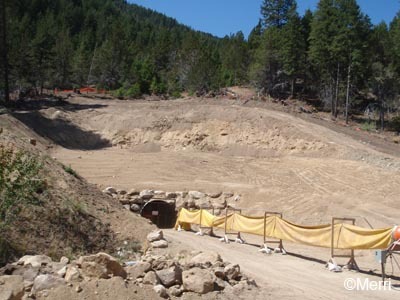 Scotch Bob connects to the Silver City Road (if there are no locked gates; an old mining tunnel is being reopened, so who knew if public access was cut off); roads off Scotch Bob should eventually reach Silver City, though that would take other days of exploring. We cheated a bit by hauling the 6 miles of boring straight bumpy rocky road up to the base of the mountains to start out on the route we we picked out. 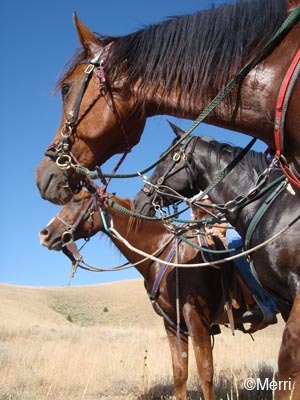 Unloaded the horses - and realized I forgot the maps. Regina thought she had most of the trails in her head. We wouldn't get lost, and I at least had a GPS to take waypoints if we had to navigate back somewhere, and to see later where we'd gone on the maps. We started at the corrals on Fossil Creek. 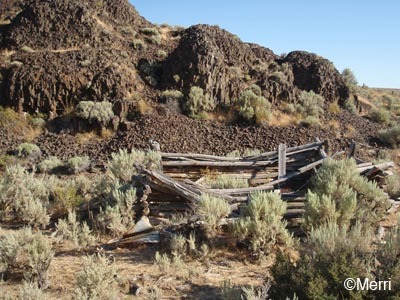 The ruins of an old cabin mark the spot of some old homesteader. Presumably someone lived there back in the days that water was flowing, because Fossil is bone dry now except for the 100-year flash-flood. We crossed a ridge into the Gerdie drainage (eventually reaches Sinker Creek) and hit an old road that wound up into the mountains. Quite scenic - and quite rocky. And it got rockier. Hard to believe anybody would drive on this road, but it's been done. 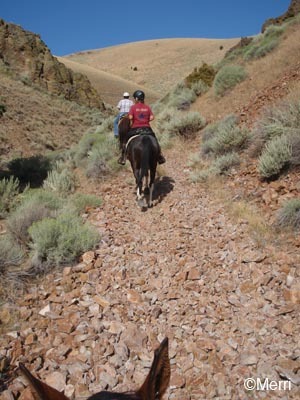 The horses were having a hard go along half a mile of scree slope, where the rocks were the road. and still had more to climb. Jose was panting when we reached the saddle at 5600' (we'd started out at 4100'), but it didn't stop him from noticing the spectacular view of the spread of the headwaters of the Sinker drainage. We could see Burnam Flat up there to the southeast (another 1600' up), and in the distance to the north, a little piece of the Silver City Road. At this point, Jose, August, and Krusty the Younger were sure glad they aren't cow ponies, because Regina was pointing out an even higher ridge they'd ridden to gather cows. 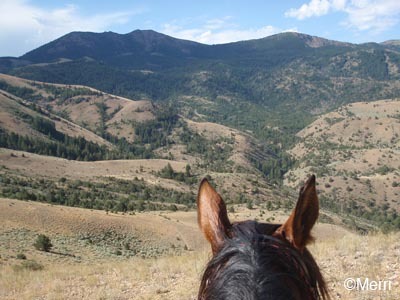 Her mount Mufasa (who's ridden that ridge) was nodding his head in agreement. 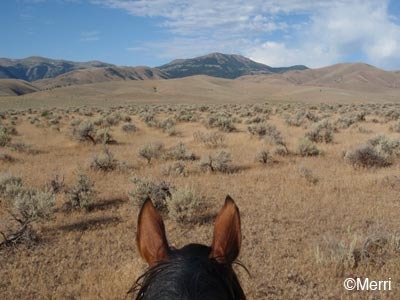 Those cow ponies have to be tough for the amount of ground and the kind of country they sometimes cover searching for cows. And they could move fast too - Steph and I had learned that when we thought we'd be cowgirls and help a local rancher round up a bull. 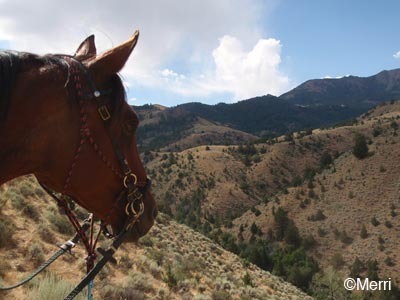 We saw a lot of cows back here in the mountains, and wondered how on earth the cowboys know how to find the ones that don't want to be found. 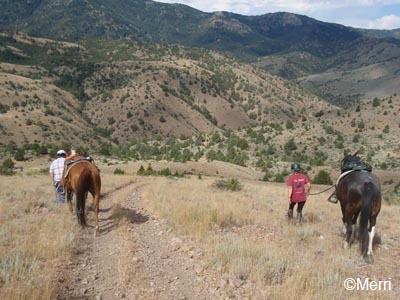 We got off and led our horses down, down, down from the pass toward the creek below, thinking we sure didn't want to have to go back up this on the way back. Unbelievably we saw ATV tracks on the road. Braver souls than me and Jose! We alternately rode and led down to this unnamed creek, Jose ogling the view along the way. We came to a fork in the creek, and here's where Regina's good memory of the maps faded (mine was kind of non-existent, anyway). She thought downstream was the North Fork of Sinker and it would eventually hit Sinker Creek; but the decision on which way to go was easy, as no road or trail continued downstream, and the road continued up the other fork of the creek. The road began showing so many ATV tracks, that we figured we had to be on Scotch Bob road. Sure enough we came to some signs of human life: campers, holes in the ground, and miners. Jerry was busy at work mining his claim for gold. 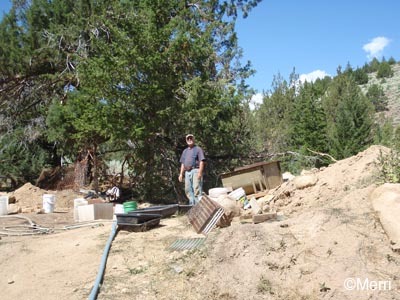 Yes, he said, we were on Scotch Bob road, there was a waterfall nearby, a road that would take us to Silver City, the Sinker Tunnel down the road, and the Silver City road 2 1/2 miles away. We'd done it! Already we'd decided there was no way we were backtracking over what we'd done, so we set off at a trot for the Silver City road. 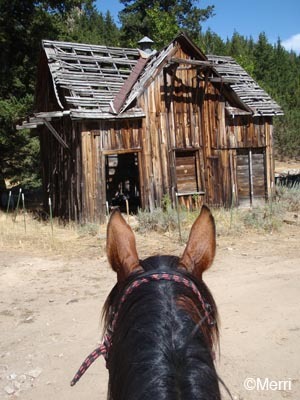 and an old mining cabin still standing. We hit the Silver City road and zipped the 4 miles down to Sinker Creek. From here we'd travelled 15 miles; it was probably at least 10 back to the trailer (it would be rocky, but not difficult, and little climbing like the last 15 miles). We considered calling Rick to come pick us up, but by the time he got to us, we'd probably be almost at the trailer. 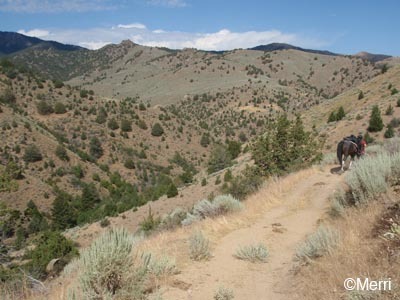 It wasn't too hot a day, so we rode back - and oh, what a trail! 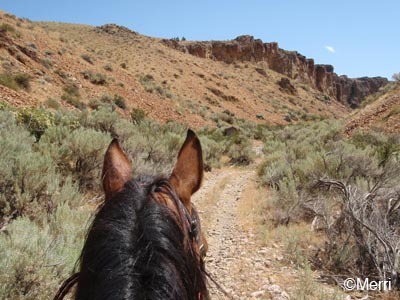 Sinker Canyon is the archetypal Owyhee County canyon - rugged high-walled ryholite cliffs framing a creek (this one flows year round) - a treasure hidden in the rolling desert hills you see from the highways. Most of it is rocky creek bottom that we had to walk, but both Jose and I were gawking at the scenery anyway. 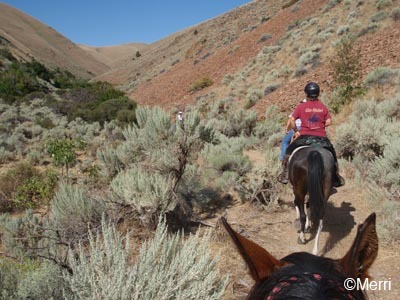 Carol knew to turn up the North Fork of Sinker - this is the same trail Steph marks for the Sinker Canyon day of the Owyhee Canyonlands - and we followed our familiar old trails back to the trailer. We sure were happy we'd cheated and saved ourselves the extra 6 miles of slow riding home. After the fantastic ride Jose was only a little tired but I was whooped. We'd ridden about 26 miles in 6 1/2 hours, a strenuous Limited Distance ride, though I felt like I'd been about 75 miles. 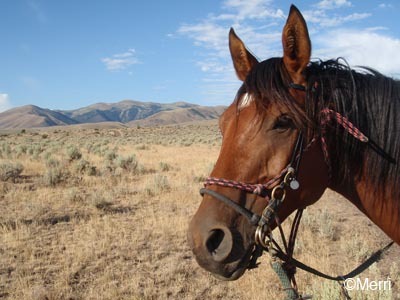 I'm glad I'm not a cowgirl, and Jose sure is glad he's an endurance horse and not a cow pony. Those cow ponies sure earn their oats!